Hotels in Puerto Vallarta welcome everyone but there are specific locations that cater to the gay crowd and go the extra mile to make sure their guests are not only comfortable but provided with the best concierge services. We have friends who recently had their entire family stay with them at a gay hotel and everyone was treated equally. Welcoming parties, shows, a majority of gay guests and a nice at-home feeling are what you will find at the following accommodations. 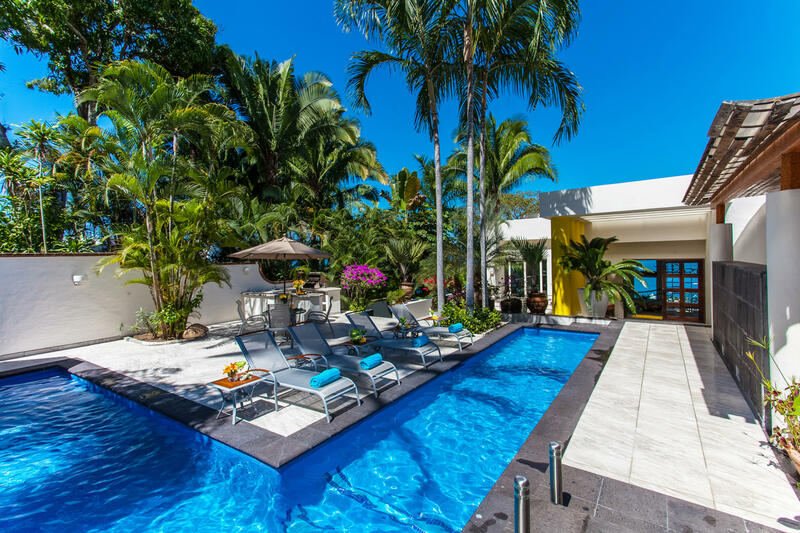 All have private baths, air conditioning, parking and are within less than half an hour drive from the airport in Puerto Vallarta. Blue Chairs Resort has a variety of rooms for all budgets. Rooms range from double standards to master suites and kitchenettes, with high season rates as low as $63/night. This hotel is about as close to the beach as you’ll get across from Los Muertos, and has their own rooftop bar and restaurant. They offer a continental breakfast buffet and have a lower level bar/café. 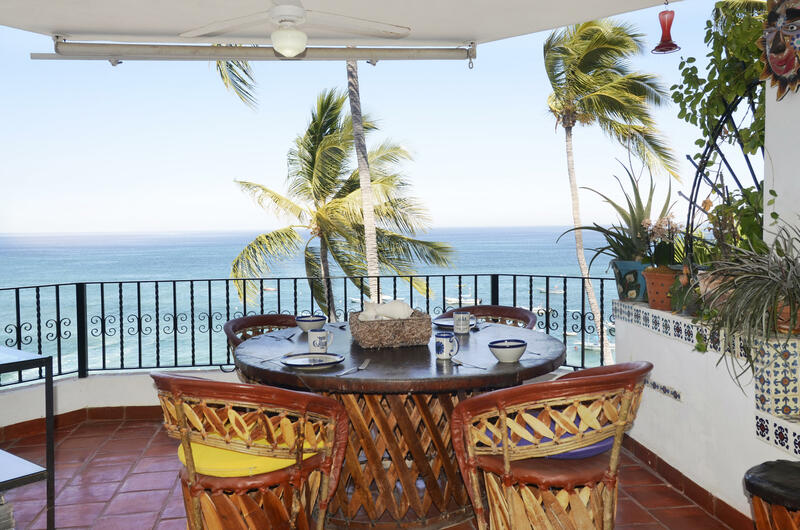 Rooms are stylish and often include Mexican rustic furniture. They provide flat-screen TV, free Wi-Fi, safes, tea and coffeemakers in-room. 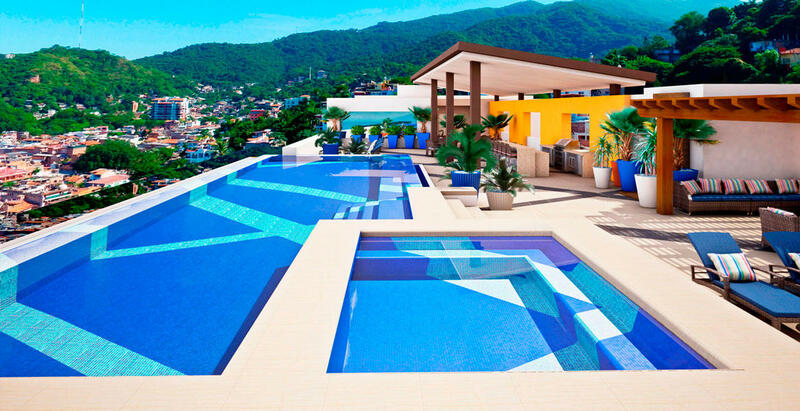 Blue Chairs Resort has a full service spa, a rooftop pool and fabulous views, with balconies on some units. Casa Cupula is a boutique hotel approximately five minutes from the beach, on foot. This is an adult only hotel and their prices are also very inviting. 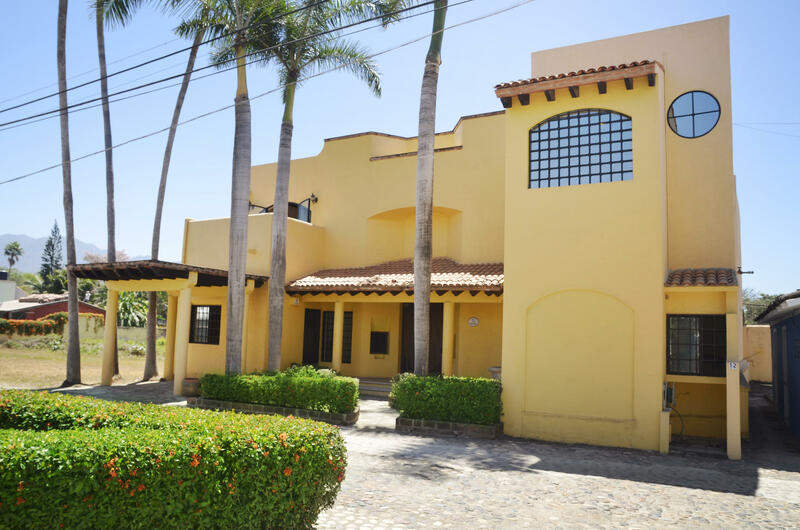 If it’s a more intimate setting you’re looking for, Casa Cupula is for you. With two swimming pools, hot tub, spa and a roomy terrace, plus an onsite gym, there’s not a whole lot more to ask for. But…they also have an onsite restaurant Taste, which gets rave reviews for their international cuisine. 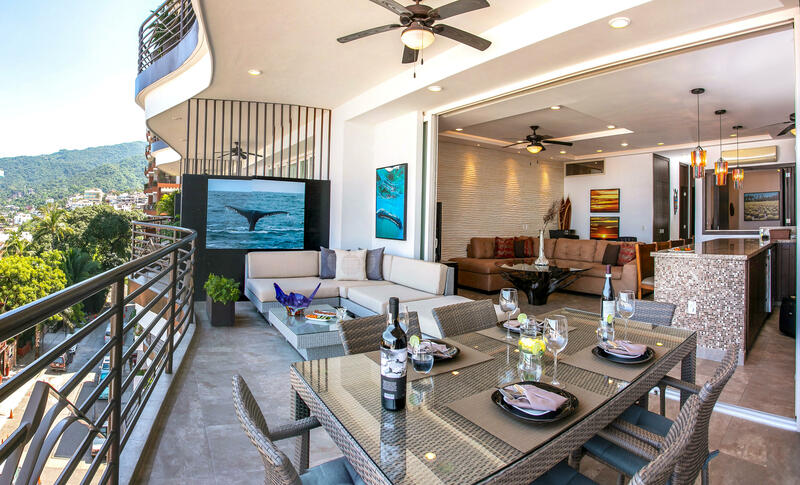 A casual bar onsite is a good place to stop for a fresh margarita before settling in to your beautiful decorated room, which is fully air conditioned. Other amenities include in-room mini-bar, coffeemaker, bathrobes, safes, flat-screen TV with DVD player and free WiFi. You’ll get a lot of bang for your buck peso at this Puerto Vallarta location. 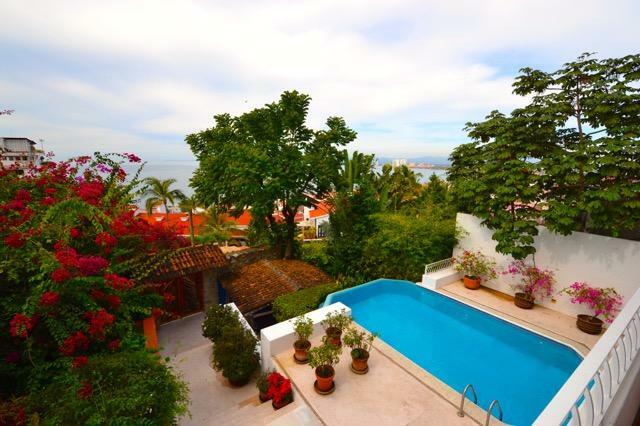 Olas Altas Suites has long been a favored destination in Puerto Vallarta for gay couples and is very family friendly. People go back to this location year after year and are pleased to be recognized by the same loyal staff. It is up the street from Los Muertos Beach and steps away from several gay bars, restaurants and clubs in the area. Taco stands and fine dining are adjacent to the lobby, with their own Restaurant Michel, serving Italian fare onsite. All suites provide fully equipped kitchenettes, TVs, free WiFi and the pool at the sister hotel is available for guests at the suites. 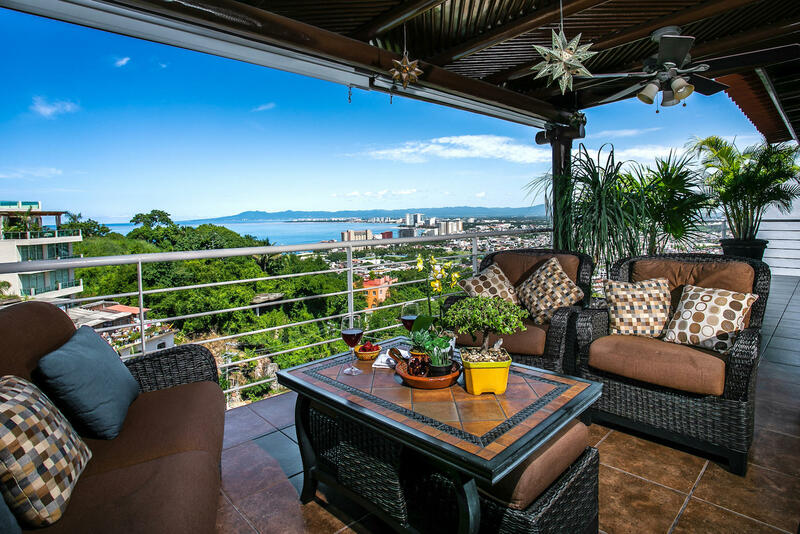 Hotel Mercurio is located up the street from the famous Puerto Vallarta pier. Step out the front door and there it looms at the bottom of the street. A huge appeal of the Hotel Mercurio is its pool, which is open 24 hours a day. Massages are available upon request and the pool bar is open from early in the morning until very late at night. It’s a perfect spot to be on a hot summer night after dancing and partying. Gourmet breakfasts are another Mercurio specialty. 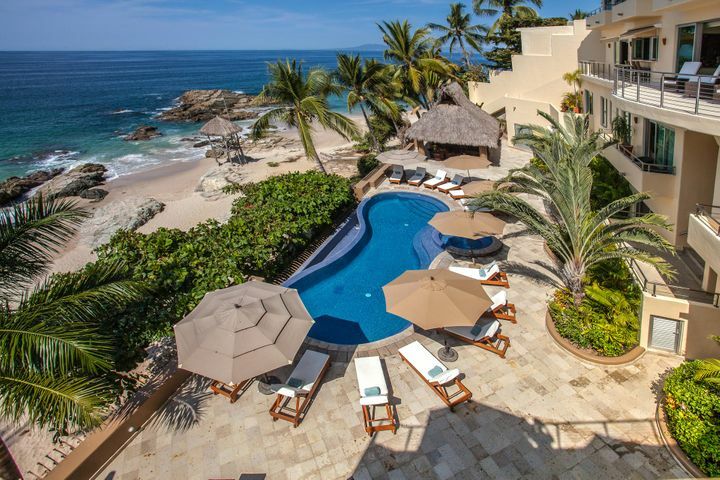 These hotels have on hand whatever you need for a day at the beach; towels, umbrellas and beach chairs, some for an additional charge. Pet accommodations should be inquired about ahead of time.